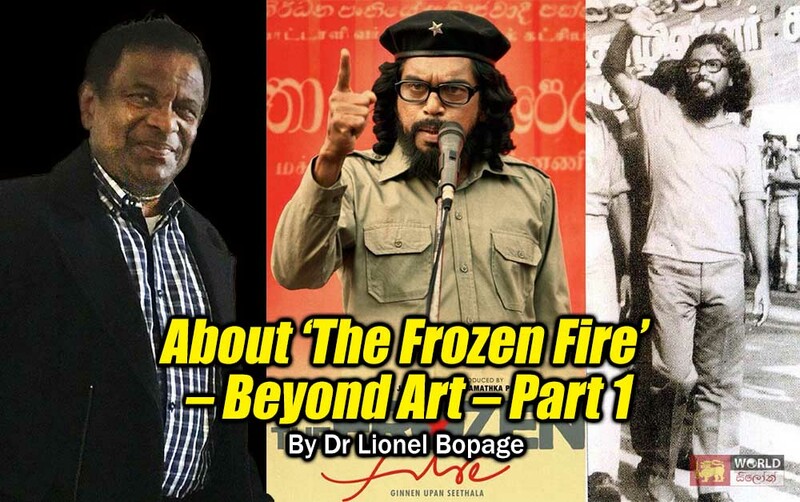 (Lanka e News – 29.Jan.2019, 1.20PM) Comrade Gamini Muthukumarana in his article ‘A Response to Comrade Bopage on The Frozen Fire’ (ගින්නෙන් උපන් සීතල ගැන බෝපගේ සහෝදරයාට පිළිතුරක්) has raised a number of important issues regarding the article I wrote: 'The Frozen Fire’ – Art and Political Reality (‘ගින්නෙන් උපන් සීතල’ – කලාව සහ දේශපාලන යථාර්ථය). At the outset let me thank comrade Gamini for his contribution to this dialogue. This response is not about the artistic merits of the film ‘The Frozen Fire’. The idea that comrade Gamini presents whether certain historical events can be accurately depicted in the film or not, should not be an impediment to assess it as a creation of art is a sentiment that both of us share. Nevertheless, we have to move beyond a purely artistic review of the film. It is because the character and dedication of Comrade Rohana Wijeweera is not a topic that can be discussed apolitically; for not to discuss the movement brought to life by his leadership and his character is not only an injustice to the ultimate objective he hoped to achieve, but also to the people and the future of the country. In fact, the basis of our discussion is and should be, not to make comrade Rohana unpopular, to slander him or to make it inconvenient for various political parties and groups formed on the basis of the April 1971 uprising. I firmly believe that if we had drawn appropriate lessons from the uprising, the space for the society to be subjected to the negative experiences of the 1988-89 struggle could have been much less. 3. This will involve researching and studying the various characters depicted in the film. It is exactly due to those complexities that I had limited my previous article to a few simple points about the "lack of doing justice to the historical political conditions" presented in the film. In producing a film, a number of barriers needs to be overcome before moving to address the technical issues. In script writing, portrayal of material reality can only be done according to the limitations inherent in the sources institutions or individuals provide for its creation. The studies needed about the origins and the nature of the multifarious characters for making the film, are largely based only on those sources. Thereafter, production of the film needs to be financed. Depending on the ideological, political and cultural loyalties and interests of the financing institution or the individual, often certain restrictions would have to be met, or self-imposed. Comrade Gamini goes on to state: “if harm is caused to the political conditions and characters of the time by making up some falsehood or incorrect news for political reasons, those who have experiences of the time” need to oppose it. And he alleges that while commenting on the film, I have presented "a sub-narrative as well as a critical view about comrade Wijeweera leading to serious differences of opinion”. 3. the JVP should have vigorously rebuffed the regime’s political and criminal allegations by responding in the open, as the JVP had nothing to do with the July’83 pogrom. My opinion was that if the film as an artistic work, were to realistically reveal the manner in which the JVP’s political direction and the program had changed since 1983, that could have made a positive contribution while passing on an important experience to Sri Lanka's social development. Reasons for the party’s oscillation to an ultra-right position during that period has never been properly analysed. My criticism was not about the artistic merits of the film, but about the responsibility of the political entities to set the record straight as to what happened. According to comrade Gamini: “By presenting these matters knowingly or unknowingly” I have done “a serious injustice to history”. He says that to say comrade Rohana went underground on a decision of his own is entirely incorrect. “The decision to retreat was not a decision comrade Rohana had single-handedly taken following his wish, but a decision comrade Sumith, the Administrative Secretary of the party had taken under the emergency situation”, and “for safety reasons comrade Sumith had arranged to send comrade Rohana and the other comrades who were in the open away from Colombo”, comrade Gamini adds. To substantiate this argument, he points out that from Colombo comrade Rohana came to Tangalle first, he arrived in Tissamaharamaya the same night and in Kataragama the next morning. He spent the day time in a chena farm in Kataragama and as night fell left with a group of comrades to the jungle for safety. Before they entered the jungle, they came to know that comrade Somaratna Kaluarachchi and I have been arrested. According to the information I have, the group including comrade Rohana came to Tangalle first and the same night went to comrade Premasiri’s house in Tissamaharama. After spending several days at his house, they retreated to Hambegamuwa jungle. As comrade Sepala Liyanage, the General Secretary of The All Ceylon Transport Workers’ Union has pointed out, at the request of comrade Nandathilaka Galappaththi of the ‘Shakthi’ Press in Kohilawatta, he went by cab to comrade Srimathee’s house in Willorawatta the same day the communal riots started, and took comrades Rohana and Srimathee, their children and some others to Tangalle. Comrade Sepala dropped comrade Srimathee and children at comrade Vijitha Ranaweera’s house and took the rest of the group to comrade Premasiri’s house. After the group had retreated to the jungle, comrade Gamini had come from Wellawaya to join this group. Comrade Gamini offers another argument to corroborate that the decision to go underground was not a decision comrade Rohana had taken on his own. That argument is that during the first week in the jungle comrade Rohana was aware that, expecting a message from him, comrade Sumith would visit comrade Premasiri’s house. Comrade Gamini also mentions that he took to comrade Premasiri’s house, a letter comrade Rohana had written to comrade Sumith. What I gather from this story is that comrade Gamini would have left that letter at comrade Premasiri’s house and returned to the jungle. However, from the information I have, comrade Sumith has neither been to comrade Premasiri’s house in Tissamaharama, nor met comrade Rohana during this period. Nevertheless, I do not deny that Comrade Rohana would have spoken about his decision with comrades Sumith and Upatissa Gamanayaka. Comrade Somawansa Amarasinghe came to the Armour Street office about two days after the proscription of the party and told me that comrade Rohana and the other leaders had gone underground. He asked me to come with him to join them for my protection. I advised him that I did not wish to go into hiding for the very simple reason that the party and I had nothing to do with the racial riots. It was vitally important for us to expose the real situation and the falsehoods the state has propagated because if we went underground as a party the government’s misinformation campaign will take hold among the people. The Central Committee decides on the policies and programs of the party and makes strategic decisions regarding their implementation. The Politburo always makes tactical decisions as to the manner of implementing the decisions of the Central Committee. The instances the Politburo was called to meet within a day were not rare. On July 25, the party had no impediment to do so. Furthermore, the party had no Administrative Secretary, but an Organizing Secretary. That was comrade Sumith Athukorala. His responsibility was to act, supervise and ensure that the decisions taken by the Central Committee and the Politburo are implemented. It was not unusual for comrade Rohana to take unilateral political decisions outside the normal party procedures. One such example was a decision to disrupt the meetings of the SLFP he had taken at a discussion held at Mr. Maithripala Senanayake’s residence along with comrade Prins Gunasekara. That was not discussed at Politburo. Unfortunately, that decision focused an unnecessary attention of the state on the party. In addition, comrade Gamini presumes that I would have found it emotionally difficult to go underground because I had "decided to leave the party after the debate on the national question at the Central Committee in July”. In fact, even after the party was proscribed, I had no emotional difficulty in staying at the Armour Street party office. Not only I had decided to stay in the open, but I also notified that decision to the party.